With all of the schools out there that currently have made 3D printers available to their students and faculty, there are bound to be all sorts of interesting stories surrounding the use of this technology within the classroom environment. Back in May of 2014, we covered a story about a teacher named Corben White, who had his students 3D print their own CO2 cars and then race these creations against one another. Then earlier this year, in February, we again covered another project which White had created in order to show his students the potential that 3D printing can provide. That creation was a 3D printed Jelly Bean Dispenser, and it was a design that his students loved. Now comes yet another story from not White himself, but from one of his students, Uriah Jones, and it may be the most fascinating of the prints we’ve seen originate from White’s technically savvy class yet. Jones, an 18-year-old student at Windsor High School in Central Illinois, started out scouring the web for photos of Ferris wheels, to ensure that he made his model as accurate as possible. These same photos also provided Jones with ideas on printing and assembling his toy. Windsor High, a very small school with only 100 students, unfortunately does not have a 3D printer at its disposal, but teacher Corben White volunteers time on his own personal machines for the good of the students. Jones’ hand cranked Ferris wheel was designed in 17 separate pieces and it took a total of 20 hours to print out the entire thing. The assembly of the parts was very easy, Jones tells us, and it took just a short time to put together once finished printing. As for the project assignment itself, it was quite the clever idea by White, who is familiar with introducing 3D design and printing concepts to his students. This undoubtedly won’t be the last 3D printing project that White requests of his students, as he seems to really understand the importance of teaching this technology to our future workforce. Hopefully more teachers around the world can see the benefits provided in projects like these, and begin implementing lessons on 3D technology within their own classes. 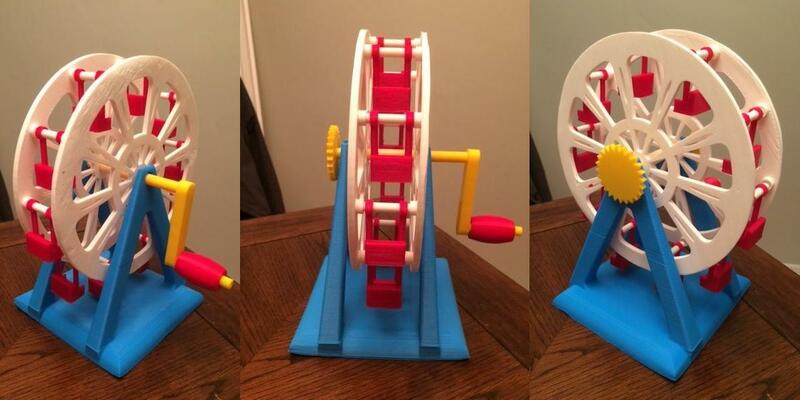 Jones has made the design files for his Ferris wheel available for free download on Thingiverse. What do you think about this incredible 3D printed toy? Is this something more teachers should be encouraging within their classes? Discuss in the 3D Printed Ferris Wheel forum thread on 3DPB.com. Check out the video of the Ferris wheel in action below.